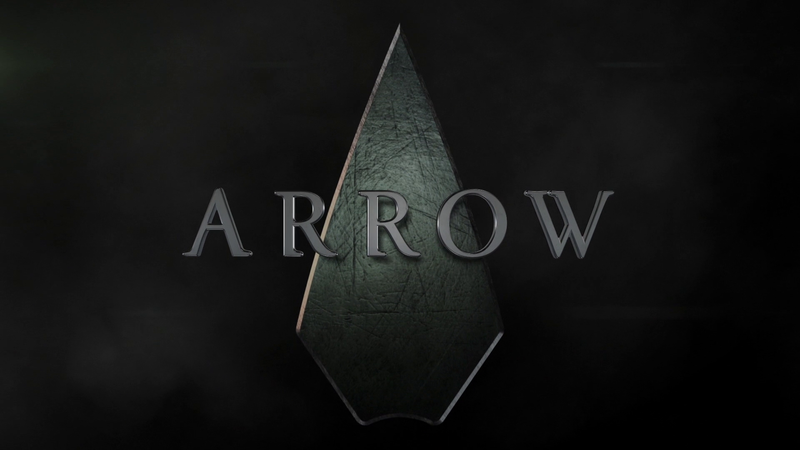 Arrow returns for a sixth season and answers the mystery of who survived the destruction of Lian Yu at the end of last season. Opening season 6 was always going to be an uphill struggle for the writers of this show. Season 5 was a creative high and the finale numbers among the best episodes of this show so following that up is a bit of a challenge. This is especially true when taking into account that Arrow has to move on from the binary narrative structure including the flashback stories. As I’ve frequently said in the past the flashbacks don’t always work but whether they are good or bad resolving that plot line means that the show has to change in a big way. The above paragraph sounds like I’m about to write a piece talking about how the episode was bad but I understand why which isn’t the case. As an episode it was fine; some good and some bad but as a season premier and a resolution of the questions lingering at the end of the last season it is somewhat limp. 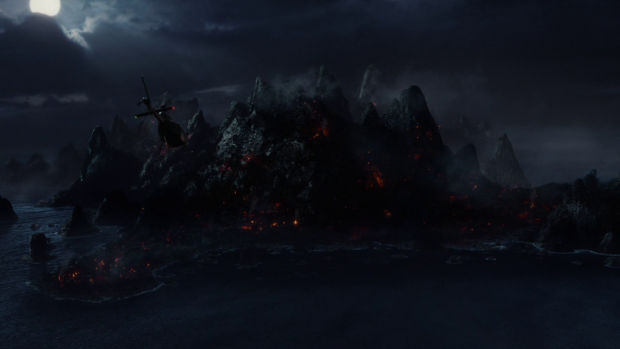 Blowing up an entire island asks a very obvious question – “who lived and who died?”. This episode acts as something of an epilogue to the events of the season 5 finale. It’s apt that it is titled “Fallout” because that’s exactly what it deals with. The most obvious survivors are Oliver and William who were safe on a boat watching the island explode. Their survival was assured and the episode makes it clear that the father/son dynamic will be prominent across this season which adds an interesting new relationship for the show to explore. Oliver seems like his normal self though he’s probably internalising his feelings as usual but William is deeply affected by the experience; he barely sleeps, has nightmares when he does and acts dismissively towards Oliver. He makes repeated reference to the “bad man” which turns out to be Oliver so it will take a long time for William and Oliver to become close. It turns out that the only confirmed death is Samantha which feels a lot like a cop out to me. It’s the easiest option as she is a disposable character since she isn’t among the main cast and her death easily brings a new element into Oliver’s life that he has to deal with. Her death scene was an eye rolling cliché as well; basically amounting to a “take care of our son” last request. It’s nothing we haven’t seen countless times elsewhere and completely lacks any emotional impact. I also found myself questioning the mechanics of everything surviving. How did they shelter themselves from an island consuming explosion? It’s mentioned that the damaged plane can offer protection but I really don’t see how. 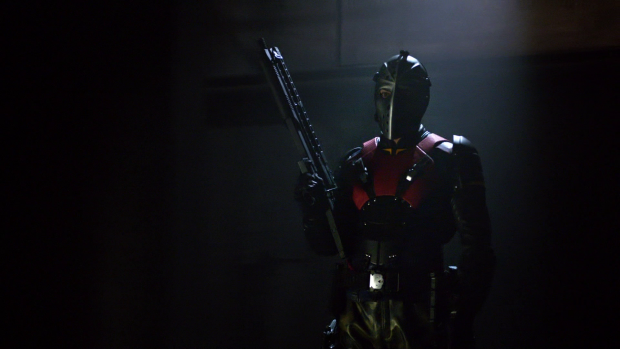 There was a real opportunity to thin out the ever growing list of Team Arrow members into something a little more streamlined as well as solidify Adrian Chase’s effectiveness as a villain by showing that his presence has ever lasting consequences. The fact that all of Team Arrow made it out alive –with the exception of Thea who will definitely wake up from her coma- is a bit of a cop out and downplays the stakes that existed last season. Of course it’s good that everyone survived as this is a great cast and it’s pleasing to see that these characters are allowed to continue to grow. The episode does a really good job of giving the surviving characters an introductory moment that almost celebrates their survival. It starts with Oliver, Diggle and Rene -in a snazzy new costume- then transitions to Curtis and builds from there. Effectively it uses the question of their survival to build suspense then introduces them in a way that fits their character. It feels like the screen time is divided more or less equally between the characters who aren’t Oliver Queen. If an imbalance existed then it wasn’t detrimental other than Thea who appears the least and is tasked with lying silently for most of it. The effect on Diggle is most curious as he appears to be suffering from an extreme form of PTSD which results in his hands shaking whenever he points a gun at someone. I can see what the writers are going for here as Diggle being emotionally rocked by anything shows how overwhelming it is. The intention may be clear but the execution suffers because we have seen Diggle put through far worse over the course of the series. It does look likely that there is more to this thanks to the reveal of an injury and the potential that exists from Diggle not being present in the post explosion flashbacks. This may be meant more as a tease rather than the whole ordeal being the explanation so I will reserve judgement for now. Dinah is settling into the team very comfortably. 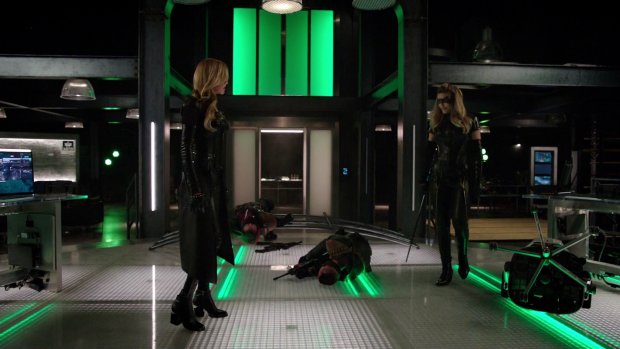 This episode establishes her as a very capable sounding board for both Diggle and Quentin. She is also characterised as being competent in her job as she has been promoted to Lieutenant and generally conducts herself in a way that suggests she knows exactly what she’s doing. This is a solid foundation for Dinah as a character in the show but there is still more work to do with her to make her come into her own. The strongest scene was when she confronted Diggle on his reluctance during a fire fight which leads to them sharing a silent moment of trust and understanding. Her bond with Quentin leads to an interesting back and forth between them. It also appears that Black Siren will be a recurring personal threat for her in a sort of “who is the best Black Canary?” type of rivalry. Quentin is falling back on old plot threads. The existence of Earth-2 Laurel aka Black Siren has affected him deeply and he’s struggling to find a reason not to drink again. He clearly trusts Dinah enough to call her when he is at his lowest moment which comes from their shared Lian Yu experience. Quentin pulled the trigger and killed Earth-2 Laurel -at least as far as he knew- to save Dinah which weighs heavily on him. Quentin’s a simple guy so the existence of alternate universes isn’t really something he can process very easily. As far as he’s concerned the Laurel he shot is his daughter and he can’t forgive himself for that. He clearly sees enough of “his” Laurel in her doppelgänger to be shaken by her presence so his current arc involves him coming to terms with the fact that she isn’t his daughter. Katie Cassidy has fully thrown herself into the Black Siren role and is clearly having a blast playing an “evil version of Laurel Lance. It looks like she is being set up as a recurring threat for Team Arrow and she is back to playing henchman again thanks to the appearance of a mysterious figure. It’s good to have Katie Cassidy back and I really enjoy this version of the character. There isn’t much to say about Curtis other than his growing confidence in the field thanks to his T-Spheres. He runs technical support for the team as usual and doesn’t seem to be visibly affected by his ordeal on Lian Yu. It remains to be seen what his character arc will be but judging by my brief chat with Echo Kellum there is a lot he would like to explore with the character. Felicity’s main focus in the episode is to remain ambiguous on her current relationship status with Oliver. They have a few conversations where Felicity offers her support when it comes to discussing William. The most striking thing about this is that Oliver quickly accepts her offer and fully intends to take her up on it. This shows a defined progression from the insular and borderline self destructive individual who unnecessarily carries the the weight of the world on his shoulders on a consistent basis. He’s now at the stage where he is willing to open up and put his trust in others. As I stated above his relationship with William is the most definitive arc for Oliver at this stage. 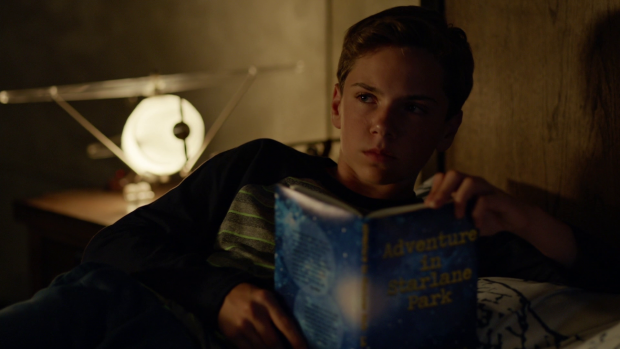 Unfortunately the episode leads up to a moment where William shows a little bit of acceptance after Oliver proudly proclaims how devoted he is to him. 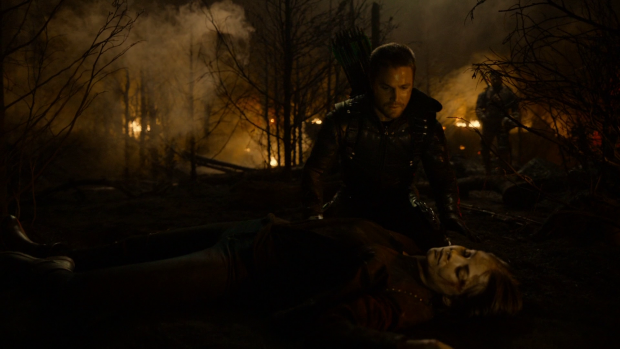 It’s a good scene that is well acted by Stephen Amell but it feels slightly unearned in the context of the episode. Another survivor of the explosion is Slade who appears briefly to thank Oliver for the information on the whereabouts of his son. Their shared fatherhood creates a slightly new dynamic between them when Slade gives Oliver advice on how living the life they do relates to “normal” things like raising a family. He tells Oliver that a man can only live as two people for so long suggesting that Slade is reaching a turning point in his life which may lead to him sacrificing one side. The implication is that Oliver will eventually come to that same realisation himself. The final scene of the episode where Oliver Queen appears to be publicly outed as the Green Arrow on television. This is ground the show has gone over before though I wonder if more time will be spent exploring the idea. How will the public react to this information; hopefully some people will approve and others will feel betrayed. Having Oliver facing trial by media for his exploits as the Green Arrow could prove interesting if done correctly. A solid opening to the season that follows on from the explosive cliffhanger ending of last season capably. The reveal of each of the surviving characters was handled well by building tension and almost celebrating their introduction in the episode. Leaving every character alive except from Samantha who is the most disposable is a bit of a cop out as it lessens the consequences of Adrian’s relentless campaign to bring down Oliver. For the most part the characters are treated well and there are some clearly defined arcs to carry them through the early part of the season. Oliver having to adjust to having William in his life is a really interesting development that is working well so far despite a slightly unearned final moment between them. On the whole this episode feels like something of an epilogue for the previous season so spends most of its time explaining where the characters are and hinting at some threats for the season. There is the mysterious unseen person who recruits Earth-2 Laurel, Oliver possibly being outed as Green Arrow to the public and Diggle’s PTSD which feels like it will become important. The season has a lot of potential though the follow up from last season’s cliffhanger wasn’t quite as exciting as it could have been.